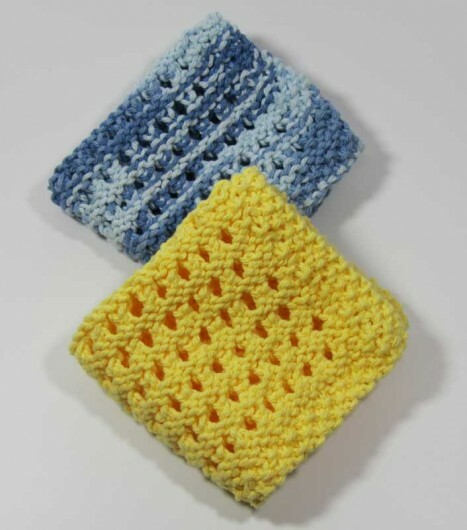 Dishcloths are not every knitters cup of tea. Some see them as a waste of stitches, not to mention yarn. 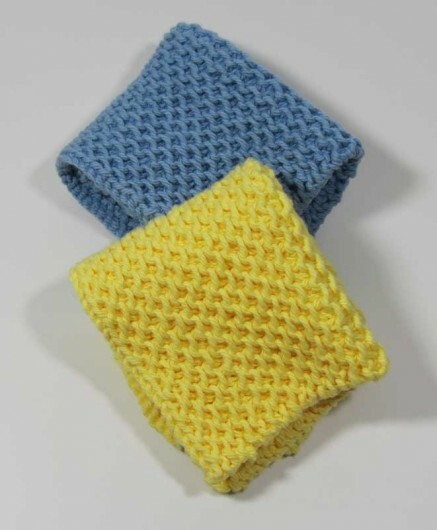 I see dishcloths as instant gratification and a chance to try out a new stitch pattern. The end result is something useful that won’t be a bacteria incubator if you wash it frequently enough. 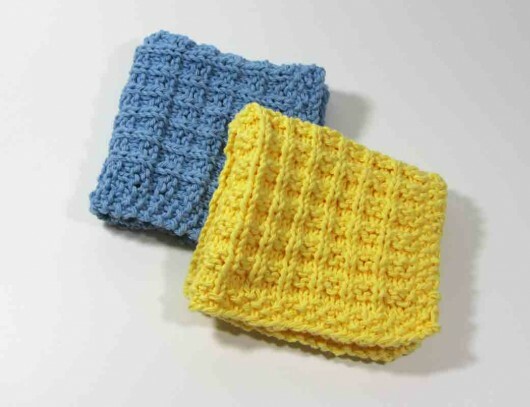 No dishcloths will look pristine after the first go-round in the washer and dryer. But pristine is not what it’s about. 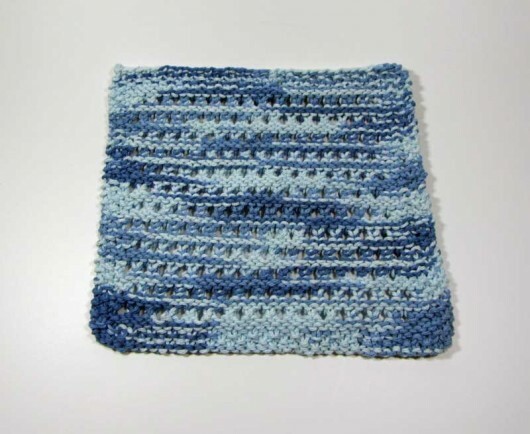 This is Jana Trent’s eLoomanator’s Diagonal Knit Dishcloth, available free on Ravelry. It has excellent texture through the middle section where it’s needed most. 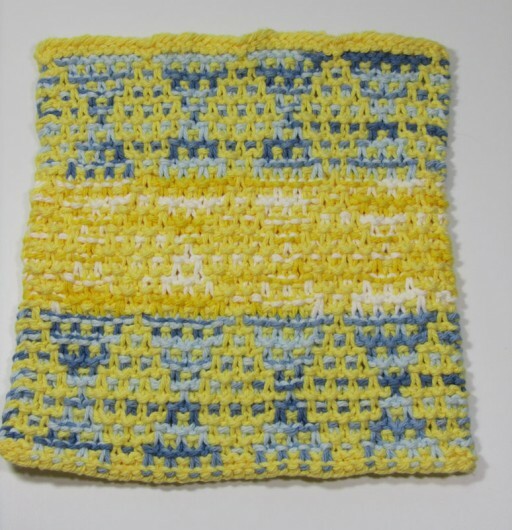 This next one is Maggie Radcliffe’s Chinese Waves Dishcloth, another time-tested pattern available free on Ravelry. I don’t know what this great textured stitch has to do with China, but the waves part sort of makes sense. Chinese Waves doesn’t have the tidiest edges. And without a very steady tension on the slipped stitches the waves will break every once in awhile. 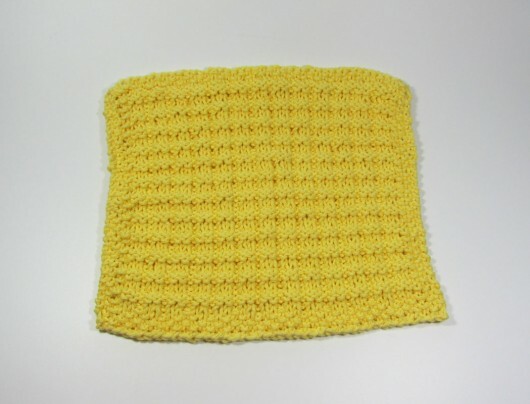 But what the heck, it’s a dishcloth. It’s going to be used to muck around in all that crud we wash off our dinner plates. These two are Anne Mancine’s Spa Day Facecloth. 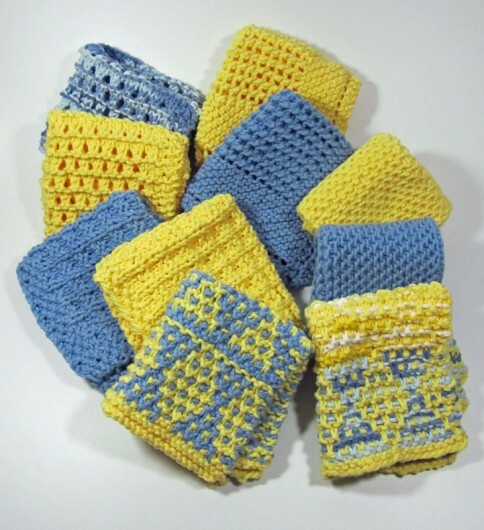 The pattern is free, as with all the cloths I knit in this set. “Spa Day Facecloth” makes it sound so fancy. But this reversible stitch pattern will work just as hard as the rest for mucking around in the dinner detritus. Here’s a closer look. 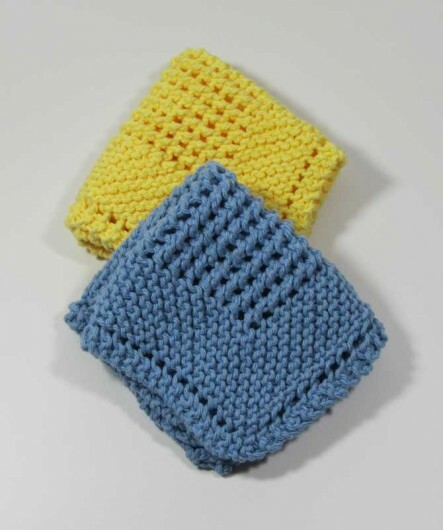 This next set is Nina Bank’s Krissy’s Dishcloth. 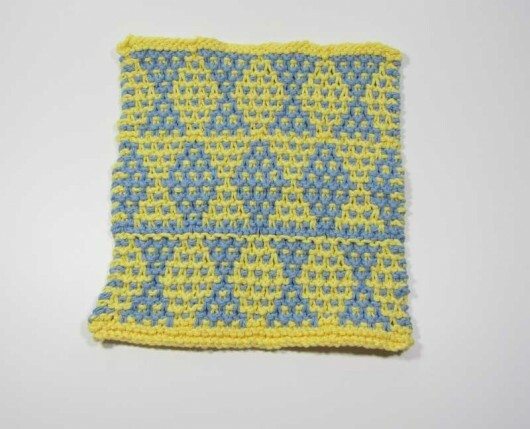 Only 14 Ravelers have knit this pattern and posted it on Ravelry. But it’s one that merits a second look if you’ve passed it by for some reason. 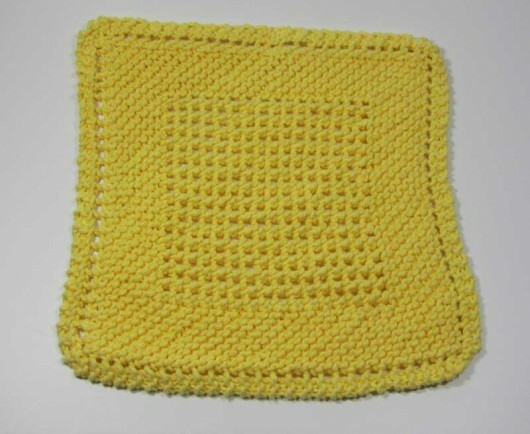 I don’t think this next dishcloth is necessarily the star of the set. But the slip-stitch work was definitely the most fun to knit. 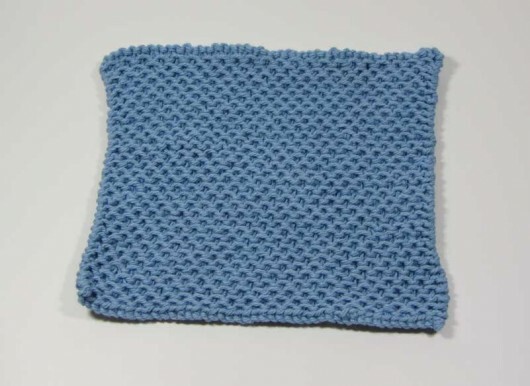 It is Linoleum Dishcloth, by Kay Gardiner of Mason-Dixon Knitting blog fame. I don’t know what that extra line of blue is doing in there. The pattern calls for a tri-color treatment and my Sugar ‘n Cream was pretty much creamed by this point. So I tried for a 2-color. It went a bit rogue. Here’s its mate, also not a wildly wonderful aesthetic success. Apparently using up the remaining oddments of two shades of ombre and one solid shade aren’t the best way to go on this pattern. If you look closely, though, you’ll see I ditched that extra line of solid color between the hourglass rows. Next time, my linoleum is going to get a three-color solid treatment. It will have a great retro look. But these will get the jobs done. And that’s mostly the point of dishcloth knitting. This entry was posted in Knitting and tagged Anne Mancine, Brush Creek Mill, Chinese Waves Dishcloth, eLoomanator's Diagonal Knit Dishcloth, Jana Trent, Kay Gardiner, Krissy's Dishcloth, Lily Sugar 'n Cream, Linoleum Dishcloth, Maggie Radcliffe, Mason-Dixon Knitting, Nina Bank, Spa Day Facecloth by Noreen. Bookmark the permalink. One has already seen use. I only had a single old ragged one left from those mom had made years ago. I don’t think I’d actually used that one in quite a while. I found it buried in the back of a kitchen drawer while trying to decide how many new ones I had room for in the kitchen. In case I haven’t told you – I enjoy your blog. @Thomas…thanks so much, ‘lil brother!